The third volume of the German Surname Atlas has just been published. It looks at the morphology of surnames, i.e., how surnames come to be formed. The 365 maps document with impressive clarity the distribution of various diminutive suffixes in German family names such as -el, -lein, -le, -ken, -chen in names like Merkel, Eberlein, Bäuerle, Seidl, Wilke, or Schmidtchen. Surnames such as Schmidbauer and Kochwagner, for example, are formed from the names of two professions and are almost exclusively to be found in Bavaria. Hyphenated surnames, such as Müller-Lüdenscheid, are largely limited to the regions of former West Germany (see illustration), since family law in the old German Democratic Republic prohibited double names. The new volume focusing on morphology includes a grammar section with more than 30,000 names on 1,134 colored maps. The first two volumes of the German Surname Atlas document the various distributions of vowels (volume 1) and consonants (volume 2) in surnames, e.g., the distribution of Meier/Meyer/Maier/Mayer, Schmidt/Schmitt/Schmid/Schmied/Schmitz, or Walter/Walther. Among other things, the map commentaries provide information on the origin and meaning of the names as well as the distribution of individual variants and historical spellings. The next three years will bring three further volumes that will examine the meaning and motivation behind surnames. Volume 4 will examine surnames derived from place of origin and residence, volume 5 will concentrate on surnames derived from professions and so-called nicknames, and volume 6 will consider forenames used as surnames. The German Surname Atlas is being produced in a joint project supervised by Professor Dr. Konrad Kunze of the University of Freiburg and Professor Dr. Damaris Nübling of Mainz University. The project has been receiving funding from the German Research Foundation since 2005. 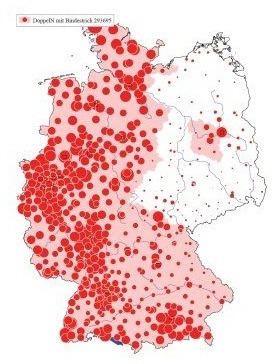 It not only provides a new basis for the study of onomastics by creating an inventory of the distribution and status of surnames in the Federal Republic of Germany as of 2005, it also provides an essential academic tool that will benefit other disciplines from social history through studies of settlement and migration patterns to genetics. Despite the numerous displacement and migratory activities of past centuries and the increased mobility of modern times, name landscapes have remained remarkably consistent since their initial historical development. Hyphenated double names, such as Müller-Lüdenscheid, are generally limited to the area of former West Germany.